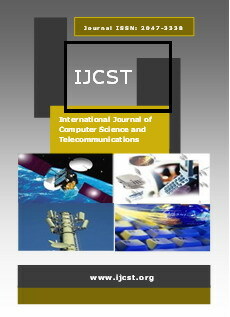 Abstract - This paper presents the evaluation performance of a hybrid satellite constellation network which provides internet access based on various Transport Control Protocol (TCP). Given known constraints on the hybrid satellite constellation resulting from network performance evaluation criteria. The evaluated satellite network uses the COMMStellationTM constellation topology operating on Low Earth Orbit (LEO). The simulation results show the performance evaluation criteria which are Throughput, the percentage of Dropped Packet, Mean End-to-End Delay, and Jitter of traffic each various TCP protocols. All simulations are simulated using the network simulator 2 (NS-2). Abstract - In the past, positioning, tracking, mapping and navigation, depend largely on astronomical observations that consist of measuring position of the sun or particular stars. Thus, orientation of any line or position - latitude, and longitude - of point can be determined. On the other hand, field observations of the relative positions of points can be plotted and oriented to produce a map. Map can also be produced directly by plotting referenced positions of measured points. Today, these techniques are no longer be used. This is so, because astronomical field procedures and computations are difficult and time consuming. Moreover, Global Positional System (GPS) make these operations simple and saving time. In this research work, tracking and mobile mapping system was developed. This system allows continuous observation of coordinates using GPS receiver. These coordinates are then either transmitted in a stream mode automatically through android streamer or sent point by point, to a web page including a satellite image covering the target area. Thus observed points can immediately be appeared in the computer monitor. These points can then be saved as track or map. The developed system assists to track vehicles or peoples at a distance. Moreover, maps can be remotely produced. Abstract - A biometric system provides automatic identification of an individual based on a unique feature or characteristic possessed by the individual. An iris recognition system is a highly secure and confidence biometric identification system. In this paper, the iris recognition system is considered by using a neural network based Feed forward distributed time delay and Hamming Distance (HD). Hough transform is the standard algorithm used for segmenting the iris patterns. Daugman’s rubber sheet model is used for normalization and unwrapping. Gabor filter is used for feature extraction. There are few public and freely available databases. For the purpose of research and development the system is tested on a CASIA database which contains nearly 4500 iris images. Sadiq B.O, Abubakar A.S, S. Garba, Y. Ibrahim and Saidu S.
Abstract - This paper modelled an effective video conferencing application over an existing wireless network. The topology of an existing wireless network was obtained and simulated using the Riverbed Modeler 17.5 software with a view to determining if the existing wireless network was capable of running a video conferencing application. The Riverbed Modeler 17.5 software was used to model and simulates the behavior of network in a wireless environment. The Result analysis showed that, the modeled network has highest delay of 0.1225 bytes and lowest delay of 0.01, which resulted to severe throughput degradation. The throughput result was just 80 (Mbps), which is below the required throughput of 100 (Mbps) for an efficient Video Conferencing application over wireless network. From the results obtained from this simulation work in comparison with the requirement, it showed that the modeled network does not provide sufficient requirements for video conferencing application. Abstract - Developing applications for the Internet is one of the newest challenges developers face today. The growing capability of the Internet has created a demand for applications that use geographic information systems. When building GIS applications for the Internet, a developer can choose any of a number of architectures, technologies, and methods. This paper focuses on development and implementation of a web-based GIS application for e-business.